It’s just a marketing gimmick, people! Don’t fall for it. What you need is human technical expertise, NOT just good technology. Feeling confused? You are not alone! But wouldn’t it cost me a fortune for all these hosting services? Here’s a REAL web hosting service for small business. Contact us today! Claim your coffee. No gimmicks here! Promoting their web hosting for small business service, mainstream business web hosting firms will try all sorts of gimmicks. Perhaps, you too have seen similar ads out there. We are in North America, the land of marketing, but gimmicks such as these are diffusing the issues and divert attention away from what is REALLY important. Web hosting for small business marketing gimmicks are not helping your business. Assume someone gives you a spaceship – just the hardware. Can you go to the moon? Like so many other business clients, choosing a web hosting for small business service may have never felt more confusing. With technical terms such as “processing power & memory”, “bandwidth”, “DNS”, “1-click WordPress install”, countless “installation scripts at hand” and so many more, you may find yourself stuck at the beginning, unable to even decide which plan is best for you. Here at COMMbits we offer a completely different approach for your small business web hosting needs. One that is based on true, qualified human presence every step of the way. Here is an attempt to demystify some of the most frequent sales pitches hosting companies use in their efforts to promote their web hosting for small business services. Do you feel any of these are inaccurate, or exaggerated? We would like to hear your views and your own experiences in the comments section at the bottom of this post. How much bandwidth is “unlimited”? Could Facebook use an “unlimited bandwidth” web hosting for small business service for the cost of a coffee-a-day? Obviously, there are stipulations, and small print! Web hosting companies know how much bandwidth a small business requires. (It is minimal, really.) So, they bundle together a large number of web sites on the same line. They claim “fair sharing” of resources. But if your neighbor consumes a lot of bandwidth then your site will ultimately suffer. Or – even worse – if your site one day generates more traffic – say because you just executed an ad campaign – the service provider will not supply that bandwidth, and your site will slow-down. A slow website can be detrimental to your business. People will not wait for a slow web page to load. “Unlimited” really means “no extra costs for any amount of bandwidth your site consumes”. However, there is no real benefit to this, unless all site visitors can read your website in proper speeds, all the time. Last thing you need is website sluggish performance. Back to your garden hose: Think of a very wide hose, with little water supply from the main supply, or a very thin hose with large main supply. Either case is NOT good! Mainstream web hosting companies know how much disk space a small business website requires. But claiming “unlimited”, doesn’t mean you will use “unlimited”, unless you upload 10,000 DVDs on your web space. In that case, they will shut you down, guaranteed. So, they are offering you something they know you will NEVER use. Simply, it sounds “cool”: “Unlimited web hosting”. Awesome! “1-click install”-what? I’m sure you’ve heard about WordPress by now – the leading Small Business web design system, which is free to install on a server. But do you REALLY know how to configure things, decide which plugins you require (almost 50,000 of them, Spring 2017), which of those are safe and secure to use, without conflicts with one another? Would you know which theme to use and why? (There are myriads of choices.) How to best utilize modern web design elements? Will the theme you have chosen be supported 6 months from now, or will your site collapse because of an outdated and unsupported theme? People often reach out to us for help. It is amazing how frequently we see many or all of these scenarios occurring on websites! FACT: Some clients come to us after their website has been hacked, or is broken-down. In many cases these are direct results of self-installed WordPress sites, which quickly became outdated. How about caching, backups, security and disaster recovery? These are all critical technical questions you are not supposed to be in a position to answer simply because it’s not your area of expertise. So, in my opinion, “1-click WordPress install” is not only useless, but I can argue it can bring havoc to your website. Your precious online presence will become insecure, outdated and exposed to online threats. The consequences to your business can be dramatic. Take no chances. Contact us today! Just like in the case of “1-click WordPress install”, many mainstream web hosting firms offer their own, proprietary “web site builder” and spin this as an advantage. In my opinion, absolutely none of the automated builders compare to a hand-crafted design service. Also, an automated and proprietary web site builder is a “closed” system. You will not be able to upgrade the system as your website business needs change in the future. In addition, please note that many automated web site builders inject a lot of underlying code, which cannot be altered and may slow down your site, and will negatively affect your search rankings. Site speed is critical to your Search Engine rankings. Even worse, your work will not be transferrable to another service, in case you change your mind down the road, or if your business needs grow. You will have to hire someone to redevelop your website from scratch. Nevertheless, and despite these obvious disadvantages, companies offering web hosting for small business packages still include “Free Web Site Builder” in their sales pitch. If a customer seeks a top-performing website (i.e. proper exposure in search engines, and high conversion ratios) a free website builder won’t cut it. Therefore, this offering too is nothing but a gimmick. FACT: All our business clients come to us for their business web design needs because they don’t know HOW to build a website. Therefore, web hosting for small business packages that include “free” website builders are absolutely useless to them! They wouldn’t know what options should go on their site’s main menu and how to label them. Colors. Photo selection and image compression. How to write content the SEO-friendly way. They wouldn’t know what to include in their site or how to structure things. In terms of designing your site, and if you want to get serious about your business online presence, you should turn to a professional small business web design service. An automatic builder, other than preset choices of templates and colors, doesn’t help; it’s just another gimmick to lure you in. Most probably, the technical jargon associated with web hosting for small business packages doesn’t even mean anything to you. All you want is your website to be up and running at all times, performing well (side note: “fast”), stay safe against hacking attempts and other online dangers and rank well is Search Engines. SEO – Search Engine Optimization – among a plethora of other things, deals with how exactly you structure your site and write your content in a way that is friendly to Search Engines AND humans. This requires knowledge, experience and time. If you attempt such important work on your own – say using an automatic website builder that came with your web hosting for small business package – you are taking serious risks. For example, you wouldn’t know exactly how to structure your site for SEO. Or even worse, stuff a lot of keywords. Subsequently, Search Engines such as Google may penalize your site or put your site in the Google Sandbox. Furthermore, some automated website builders do not allow full code customization. Configuring caching methods, and optimizing your code would then be impossible. End result would be a low Google PageSpeed score. See Boost Your SEO With Better Site Speed to learn how to further test and optimize your site, assuming of course that your automated page builder allows you to do so. All your hard work could yield zero results in search engines. Also, your website may not be able to convert visitors to sales leads, because you didn’t know how and where to position Call-To-Action components. Without proper placement ranking, Search Engines will not return search results for your site. If you do decide to use a free website builder, you may find our Search Engine placement ranking tips for local small businesses very helpful. Mainstream hosting firms offering web hosting for small business are not telling you what really needs to happen on an ongoing basis behind the scenes for your site to keep performing at its best. So, what are the real challenges of hosting a business website? In short: YOUR BUSINESS WEBSITE REQUIRES ONGOING WORK BY EXPERIENCED ENGINEERS. Other than utilizing modern software, experienced technicians and Systems Administrators must monitor your website and perform work on it regularly. They must perform a number of critical functions, behind the scenes and “silently”, without messing-up with your business, on an on-going basis. Firewall: Perform regular firewall inspection and tune-ups. Back-end systems receive upgrades all the time. As a small business owner you don’t need to know what a “firewall” is, but you should at least ask your web hosting company: “Does a firewall protect my website?” (Side note: A ‘firewall” is a hardware or software system (or both) that acts as a security “wall”, protecting your site from potential online attackers.) Can your firewall, if one exists, block certain countries notorious for harboring spammers and hackers? Has anyone ever configured that specifically for your site? Hacking: In the event website attacks and breaches occur, will anyone (a knowledgeable human that is) take action and provide immediate treatment? Important Note: Please take website security seriously. If you have your website hacked the effect to your business operations may be profound, or even disastrous. If you suspect your website has been compromised, of even if you are not sure if your website is secured, please reach out to us immediately for assistance. In addition, make sure your off-the-web data is also protected. A Business Cloud Backup managed service is a great disaster recovery solution! Website performance is of utmost importance for human visitors and Search Engines alike. You must improve your website’s speed, if you want decent search engine placement rankings. Also, a slow site will immediately turn human visitors away. Code Upgrades: Special software runs your website. Old and stale code will make your site slow, and expose it to online threats. Before you know it, attackers will break into your site. (If that happens, you are not alone. Ask for help immediately.) Many website owners wrongly assume that their website developer has them covered. Ask your web developer: What work do they do on your site on an ongoing basis, and at what cost to you? Caching: Caching techniques dramatically improve website performance. You need the service of an experienced person to custom-configure and fine-tune a caching system on your site, specific to the needs of your own site. The intention here is not to write a technical bulletin on caching. For the purposes of this post, a “caching” system stores most frequently accessed components of your site on high-speed local storage (i.e. high-speed disk or memory). Other techniques utilize multiple off-site storage centers closer to your visitors, i.e. Content Delivery Networks – CDN’s. Turn to our related article to learn how you can test your site speed and boost your SEO with better site speed. However, our 20 years of experience points to something quite revealing. Small business website owners RARELY go about changing content on their own. Sometimes because they forget how. Or because last time they attempted this, they ended up messing up their web pages. Or simply, because they don’t have the time to re-learn how to use the system. Clients are telling us constantly that no matter how simple we make it for them, they prefer to ask us for small changes on their websites. (Address changes, adding new services or products, new staff pages, changing a paragraph of copy text, etc.) Most mainstream small business website hosts feel they are “off-the-hook”. “Here are the tools, do it yourself”. They “spin” a self-maintained website” as an advantage. Larger companies have qualified human resources in-house that can tackle most website updates using tools included with a business web hosting package. For the small business owner, however, such technology does not help at all. Most of the times they don’t even know or remember how to use it. We don’t blame them. In many cases, the developer who initially built their site, disappears. When these small business owners turn to their web hosting company for updates, the latter ends up charging exorbitant fees. ANY manual intervention becomes “billable hours”. Their web hosting for small business offering is not low-cost any more. The myth of “web hosting for small business for the price of a cup of coffee” collapses in a grandiose manner. See also “pitfalls in cheap hosting services“, which include solutions to hidden charges or expensive renewal fees, written by my friend Jerry Low. At COMMbits we offer specific programs for small business web design. When you bring your small business web hosting tasks to us, we offer what we call “website maintenance & support and webmaster services“. These are comprehensive programs that tackle every facet of your on-going website maintenance and security, as described above. There are many intricate details of what we do for your website behind the scenes. Although the list above can give you an idea, we are here to provide a detailed list of what we can do for your own particular case. Please contact us today for details. Actually, you are saving money with us. There is this beautiful thing in business we call Economies of Scale. We manage hundreds of websites, on many different web hosting for small business packages. Therefore, it is easier and faster for us to effectively and efficiently perform systems administration work on them, all at once. In addition, we have the proper expertise to perform such critical functions on your business website, fast! We constantly monitor the industry for new software versions, online threats and new trends. Once a change is out, we apply it swiftly across the board on all websites we monitor and maintain on behalf of our clients. Also, at our infrastructure, different machines separate your website from its underlying database, for security and performance reasons. So, right off the bat, the cost would be twice the cost of any other web hosting for small business offering you may have on a single-server system. If you were to hire someone to perform all the work we can do on your site behind the scenes on a continuing basis (see “The REAL issues” above) you would be looking at a minimum of 2-3 hours a month. This does not account for any ad-hoc sessions to fight online attacks at real-time. At an industry average of CDN$100/hr, this alone would cost you CDN$200-$300 per month, even for a small business website. US customers: Take advantage of the weak Canadian dollar and bring your web hosting business up North. For a small site roughly as described above, your small business hosting fee with us would be something in the neighborhood of CDN$50/mo. (Dual servers, security, server updates, backups.) Add $30/mo for a comprehensive webmaster service as described above, which is mandatory. Simply put, we do not host anything on our infrastructure unless properly and securely maintained. Please note: Fees vary depending on the volume and complexity of work required for your own particular case. Please reach out now and ask us for details. We also offer managed programs (a “white-glove” service), where we take care of day-to-day operations on your behalf, related to your corporate email needs. (Creating new accounts, changing settings, aliases, distribution lists for you, passwords, etc.) We do not bill extra for any help you require. Our managed Email service is ideal for small companies that don’t have the in-house expertise, or don’t have the time, to perform such functions themselves. No matter how you cut it, it pays out. Talk to us for a custom plan. 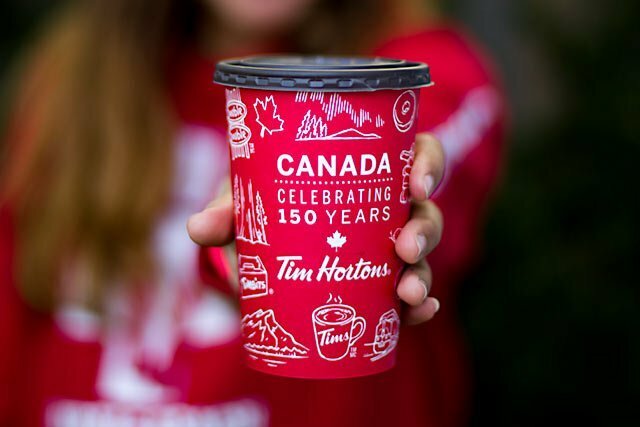 For every new annual plan you purchase from us in 2017, and to celebrate Canada’s 150th anniversary, we will send you a Tim Horton’s card, preloaded with $50. Have your coffee in peace, and leave the real-hard work to us. We will put-together a custom, small business web hosting plan for your, such that will keep your site performing at its best, always. Your web site will stay safe and protected from online threats. It will stand the best chances of reaching a decent search engine ranking placement. Ignore the marketing gimmicks. Your business needs more than just “web hosting for your small business for the price of a cup of coffee”. Let us serve you with a REAL business hosting package, and let us treat you with some REAL coffee. No gimmicks here. Claim your free coffee. No gimmicks here! Alternatively, please visit our Contact us page. Web hosting for small business. Beware of the gimmicks of mainstream hosting companies. Find out what really matters.